Americans love to gawk at mug shots, whether they’re of a fallen celebrity or a tattooed drug addict, said journalist Tim Stelloh. But in the digital age, these booking photos can haunt those pictured for years. ON A COLD, rainy morning last January, Matthew Medlin hopped a freight car in downtown Portland, Ore., and headed north. When he arrived at a train yard a few miles away, he felt something he said he often feels—a kind of magnetism that he’s come to think of as a supernatural force. Medlin is 33 and, when he’s not behind bars, homeless. He has dagger- like stripes tattooed above his eyes and four dots below them—symbols of what he described as his belief in lycanthropy, the mythical transformation of humans into wolves. He’s been a habitual methamphetamine user for years. He’s schizophrenic. In Medlin’s telling, that something in the railroad yard was a person in danger. What followed, however, was not a rescue effort, but a five-hour standoff with police in which Medlin exhibited all manner of distressing behaviors, according to court documents: He tinkered with the brake system on a liquid propane car. He injected himself with methamphetamines. He pleaded with police to shoot him. He appeared to threaten them with shards of scrap metal. In the burst of coverage that followed, there were scant details about Medlin’s backstory—not who he was, where he came from, or that he denied much of what was contained in the court documents. Tiger Woods—whose eyes-at-half-mast mug went viral after he was arrested in Florida this summer for driving under the influence— can probably sympathize. This strange cultural idiosyncrasy can be traced back more than a century, to when the photograph was among the lawman’s most sophisticated criminal identification tools. But over the decades, the booking photo evolved into something quite different. Now the images are available from an expansive roster of mug shot purveyors— everyone from crime-fighting social media groups to privately run, online databases that, in some cases, have been described as extortion operations: They post booking photographs online, then charge exorbitant fees to remove them. The result is a ubiquitous, frame-by-frame reality show depicting alleged crime and justice and starring the petty thief and the celebrity cokehead, the wrongly accused killer and the mentally ill drug addict. Free expungement clinics help the more desperate among them scrub their criminal records, while firms like EraseMugShots.com offer “removal” services for a fee. Lawyers in Illinois, Florida, and beyond have taken their grievances to court, and lawmakers in more than a dozen states have tried reeling in the more pernicious practices of some mug shot entrepreneurs, Last year, a panel of federal appeals judges weighed in on the whole internet-fueled enterprise, denying a newspaper’s request for U.S. Marshals’ booking photos. IT WASN’T ALWAYS this way. 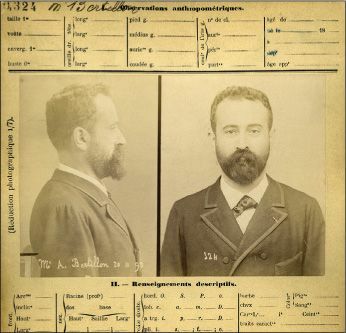 What began more than 150 years ago with “wanted” posters and rogues’ galleries had, by the last decade of the 19th century, evolved: In Paris, the records clerk turned pioneering criminologist Alphonse Bertillon developed the modern booking photograph— one frontal shot, one profile—and in the U.S., the argument for mass distribution came from one of the country’s most celebrated inspectors, the New York Police Department’s Thomas Byrnes. In Byrnes’ seminal 1886 collection of 204 images, Professional Criminals of America, he described the practice as crime prevention par excellence, a system where there weren’t just a few sets of eyes surveilling a new class of elusive criminal, but thousands. Then the internet happened. Sheriff’s offices in large and tiny counties alike now post mug shots to slick, constantly updated websites. Under its notorious former sheriff, Joe Arpaio, Maricopa County even held a contest in which visitors voted on a mug shot of the day. To Trevor Whipple, the police chief in South Burlington, Vt., the mug shot was a powerful means of transparency—at least, that’s what he thought when his department began posting them to its Facebook page a few years ago. As he put it, “Who are we arresting? Profiling is a significant concern. This is: We’ll let you see everyone” in custody. Then came the angry phone calls from people who’d been arrested and then cleared or had their charges expunged. In one case, Whipple said, a mother called about her 19-year-old daughter, whose DWI arrest had produced a tearand- mascara- streaked image that was being repeatedly reposted. “She said, ‘My daughter— this was the low point of her life, but people keep going to her mug shot on your Facebook,’” he recalled. All of this gave Whipple pause. How, he thought, will these images affect someone who shouldn’t have been arrested in the first place? In the end, he said, it was the comments that did it. “We saw people playing off personal characteristics—‘He doesn’t look smart. He looks like a doofus,’” Whipple recalled. “I thought, ‘Have we run out the usefulness of this? I don’t want to have people humiliated.’” On July 4, 2015, after a roughly yearlong experiment in social media transparency, Whipple posted a note on his department’s Facebook page declaring it dead. WHIPPLE’S CONCERNS WEREN’T misplaced. Lageson interviewed 27 people at Minnesota expungement clinics over two years beginning in 2014 and found that people had been fired and rejected from jobs—or scared to even apply in the first place. One woman had been unable to find decent housing; another was kicked out of her church. The photos were decades old, in some cases, and the people pictured in them had no idea they were online until they “popped up,” as Lageson recalled many of them saying. Most of the people Lageson interviewed didn’t bother contacting the sites that were publishing their images. They had been too overwhelmed or confused about whom to contact; some thought it wouldn’t do any good. Consider MugShots.com, for instance, which describes itself as a “search engine for Official Law Enforcement Records”—a mission it says is protected by an assortment of federal and state laws and two constitutional amendments. Not everyone has been chastened by this seemingly impenetrable legal defense. In Illinois, three men seeking class-action status filed a suit last year describing the site as an extortion racket that deliberately and routinely published inaccurate information for a single purpose: to drive people to a prominently advertised “sister” site— UnpublishArrest.com—where, for removal services, they spent anywhere from $399 (for a single arrest) to $1,799 (for five). “They were deliberately trying to use this information as a cudgel to beat people with because they are desperate enough to pay that kind of money,” said Stuart Clarke, one of the lawyers who filed the suit. Lawyers like Ferrucci and sites like MugShots.com aren’t the only ones fighting for continued, broad access to booking photos. Journalists are, too. In 2013, the Detroit Free Press sued the Justice Department after it refused to release mug shots of four police officers accused of corruption.